In epic films of fantasy and grand adventure we have become accustomed to hear a certain kind of music as accompaniment – there is indeed a type of music which we immediately connect with these kinds of films; a “musical model” of grand adventure that seems to be something basic that lies within us. And so we, or at least I, expected to hear music of this kind, sweepingly thematic, grand and powerful, in Harry Gregson-Williams score for Disney’s large production of The Lion, the Witch and the Wardrobe – the first book of C.S. Lewis’ acclaimed epic book series The Chronicles of Narnia filmed for the big screen. And mostly, the score does not disappoint – The Chronicles of Narnia: The Lion, the Witch and the Wardrobe is a thematic, sweeping score bristling with both power and emotion – much as we have come to expect for this kind of film. A bit surprising though is the quite modern touch given to some sequences – an approach that to me was a bit unexpected. These modern touches are evident from the start – “The Blitz, 1940” is an intense action piece that easily could have been taken out of any modern war film. That is very fitting of course, since Narnia takes its beginning in the turmoil of the German bombings of London in 1940. The four Pevensie siblings are forced to leave London (“Evacuating London”) to a sad reading of one of the film’s main themes – the siblings’ theme, a quite melancholic melody surfacing in fragments all over the score. The action of the first track is actually also based on the siblings’ theme. The performance of the theme in the second track, with piano in the foreground, is one of the more elaborate ones in the score, and soon, as the train carrying the Pevensie children to safety in the countryside leaves the station, the track changes style completely to unexpectedly become something more similar to a pop song with Lisbeth Scott’s wailing vocals and a soft electronic beat – something I was very surprised to hear in a film such as this. But – believe it or not, playing over the main titles as the train travels through the English landscape, it actually works quite well. As a standalone piece, maybe not as well, but it is still a rather beautiful piece. In addition to the siblings’ theme the score features two more primary themes (as well as a number of minor ones) – first the tender Narnia theme and second the powerful “heroic” theme, mainly connected with the great lion Aslan, Narnia’s highest leader. The siblings’ and the heroic theme are closely connected musically, being similar in note progression. But while the siblings’ theme is a sometimes melancholic (“Evacuating London”) and sometimes tender (the end of “Knighting Peter”) theme the heroic theme is always large and powerful (“To Aslan’s Camp”, “The Battle”) often performed by horns or trumpets in very rousing statements. The Narnia theme enters for the first time in a lovely flute rendition when Lucy Pevensie first enters the land of Narnia in “The Wardrobe”, but is saved for important moments of the film and hence only represented a few times on the album. 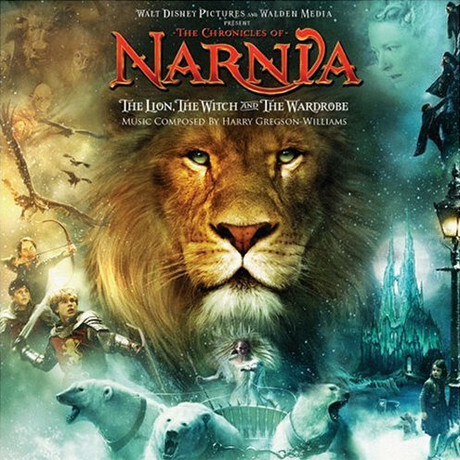 The Narnia theme is however a wonderful melody, instantly recognisable, and its few appearances are all highlights of the album – especially “To Aslan’s Camp” where the theme gets one of its most sweeping statements in the strings, together with incredibly rousing statements of the heroic theme. The most modern influences are indeed confined to the first tracks of the score, with most of the later parts of the score being of a more classical kind, so to speak, with much in common with Gregson-Williams’ other large score this year, Kingdom of Heaven. There are still a lot of unusual elements though – the otherworldy sound of the electric violin is used in “Lucy meets Mr. Tumnus”, to great effect, in “A Narnia Lullaby” Gregson-Williams uses a duduk, and in “The Stone Table” the gurgling sound of a throat-singing choir accompanied by taiko drums creates quite frightening effects. There is also a large amount of electronic percussion and other effects present at many times. And while some of these things might seem a bit out of place when first listening to the album, it all fits like a glove in the film, all a wonderful merge between image and music, and I can assure you that the album will grow on you after having seen the film – which I wholeheartedly recommend. All the time there seems to be a thought behind the music employed to create the right feelings – be it with modern electronic effects, a duduk or rousing brass fanfares. There are however parts that does not work as well on album as it does in the film. The dark, unrelenting “The White Witch” does a good job being frightening, but as a very dissonant, moody piece it does not really make for a rewarding listen. Same goes with parts of the interesting but quite challenging “The Stone Table”. Other parts, though – and this goes for most of the album, are a very rewarding listen. The orchestrations are very well done, and the thematic work is complex and commendable. The chorus does have more of a supporting role here, unlike Kingdom of Heaven where the chorus took much of the lead, a fact that made that score such a wonderful listen. But especially in “The Battle” the chorus is allowed to shine almost like in Kingdom of Heaven, in a very rousing action piece that resembles the action pieces of Kingdom of Heaven in many ways. It is anyway one of the most rousing pieces of the score and a true highlight of the album, also referring back to the siblings first true experience of battle with some quotes of the opening Blitz music. After this orchestral and choral workout follows the score’s wonderful finale, “Only the Beginning of the Adventure”, where all the themes get full readings in orchestrations both powerful and beautiful – in my opinion the highlight of the score. The Lion, the Witch and the Wardrobe is indeed very different from other scores for similar fantasy adventure films, but it turns out that it is perfect for the film, and even if there are parts that does not work really as well on album as in the film, the fifty-four minutes of score on the album are still mostly very enjoyable minutes. Once again has Harry Gregson-Williams managed to impress with very well written thematic work and well thought-out stylistic choices in a score which, albeit with some unexpected means, in the end is a worthy accompaniment to a captivating film as well as a great stand alone listen. Anyone hoping for a Lord of the Rings like rush from The Lion, the Witch and the Wardrobe is, I suggest, likely to be hugely disappointed after seeing this bland adaptation of the opening gambit in CS Lewis' Chronicles of Narnia. Weak acting, some surprisingly unconvincing effects work (not always the case, but hardly WETA's finest hour) and poor use of the New Zealand scenery conspire to produce a pretty insipid start to what Disney presumably hope will be a Rings or Potter like franchise. Then again, I'm sure I'm not alone in being rather less familiar with the Narnia books beyond The Lion, the Witch and the Wardrobe. Sustaining public interest throughout a proposed septology is hardly guaranteed, even the BBC only managed the first four books. I must confess that I was slightly unsure as to whether John Williams' Harry Potter themes would become as famous as his best known melodies, but should have known better than to doubt his skill at writing iconic tunes and his Potter music has easily entered the public consciousness. However, I do wonder whether the tunes would have been so memorable if someone else been hired. Harry Gregson-Williams' score to The Lion, the Witch and the Wardrobe gives some idea of just how weak it could have been. I've oft suspected that his co-writer at Dreamworks, John Powell, came up with all the tunes when they wrote together and The Lion, the Witch and the Wardrobe is further confirmation of this suspicion. None of the melodies here are even remotely memorable, the kind of tunes that are nicely generic for appearance in a trailer, but not really strong enough on a big budget motion picture, let alone to set the sound world for an entire franchise. As Mr Southall astutely noted in his review, if the producers of The Lion, the Witch and the Wardrobe were looking to Lord of the Rings as inspiration for the style of the film then they certainly weren't when finding an approach for the music. Gregson-Williams brings considerable quantities of his Media Ventures style percussion, notably Evacuating London, replete with a wispy female vocalist on top. Fortunately, it doesn't have an even more inappropriate middle eastern sound, but does nothing to evoke the period - not that it necessarily should, but it doesn't replace a period sound with something better, rather with something cheap and wholly inappropriate. Things do pick up, but again, the paucity of the melodic material means that it fails to generate the kind of resonance that one would hope for in a score of this sort. The folksy violin of Lucy Meets Mr Tumnus and A Narnia Lullaby feel right, but amble about with little focus and I'd challenge anyone to remember anything about them afterwards. As the film opens out from the early explorations through the wardrobe into the wider world of Narnia, so too does the music become more expansive. The chorus is used liberally throughout, although it's not used as a sonic crutch as so often happens in big scores. Indeed, many of the most effective passages are choral, notably Father Christmas (one of the story's stranger digressions) which contains material as delightful as any Christmas score. Conversely, the material for the White Witch is appropriately threatening, but still isn't especially striking beyond being vaguely ominous. The Stone Table is one of the more impressive cues with Gregson-Williams' percussive expertise put to good use, however The Battle is rather underwhelming, never really generating the kind of fervoured excitement one would expect from an epic climax. The optimistically titled Only the Beginning of the Adventure is a nice conclusion, giving way to four reasonably good, if entirely unrelated songs. However, the oft noted mispronunciation of Wunderkind by the ever pretentious Alanis Morissette is hugely irritating ('wunderkind' should rhyme with 'tint' - being a German word - and not 'kind' in the English sense. Mind you, the 'w' should be pronounced with as a 'v' but never mind...). If all of that seems unnecessarily harsh then The Lion, the Witch and the Wardrobe is not unenjoyable, just disappointing and not especially memorable. James Newton Howard managed to come up with a more convincing tunes for King Kong in probably half the time and, based on his music for Peter Pan and other Disney flicks, would probably have been a first choice for Narnia.